Now we can search anything on Google.com by speaking the words instead of Typing them. Currently Voice Search is available for US English only. 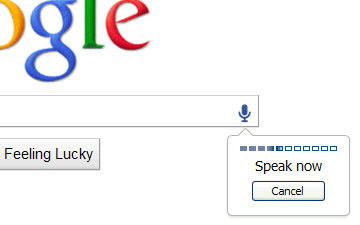 Just click the Mic icon in the Search box of Google.com in Chrome browser to start using the Voice Search Feature. Hard-to-spell searches- Makes searching words you're not sure how to spell quicker and easier. Longer searches- Search long queries, even really, really long queries, just by talking. Searches that are just more fun to search out loud - Now you can ask your computer anything. Searching without typing - Use it in the kitchen, in the garage or anytime your hands might be full. Watch below video to know more about Google Voice Search. I have tried this Voice Search feature for searching TheGreatQuotes.com site by speaking "the Great Quotes". It looks like the processing time is more comparing the speed shown in the Demo video released by Google. You can refer the below video. I am not sure how many people will start using this feature frequently. But if many people start using this feature, SEO approaches need to be changed. For example, theGreatQuotes.com site will be appearing in the first position if some one search for the word "thegreatquotes" by typing it in the search box. But if they start using "voice search", they can NOT use the word "thegreatquotes". It will be taken as "The Great Quotes" only. So, the search volume of certain keywords will be reduced and therefore keyword selection process needs to be redefined. And, Google has introduced "Search by Image" also. i-e We can do search on Google by inputting images/pictures. See the details in this video. We can do search by giving Image in any of the below ways. Drag and drop -Drag and drop an image from the web or your computer into the search box on images.google.com. Copy and paste the URL for an image -Found an image on the web you’re curious about? Right-click the image to copy the URL. On images.google.com, click the camera icon, and “Paste image URL”. Right-click an image on the web-To search by image even faster, download the Chrome extension or the Firefox extension. With the extension installed, simply right-click an image on the web to search Google with that image. Just specify an image using any of the above approaches, and you'll find other similar or related images as well as relevant results from across the Web. Google uses computer vision techniques to match your image to other images in the Google Images index and additional image collections. From those matches, it tries to generate an accurate "best guess" text description of your image, as well as find other images that have the same content as your search image. Your search results page can show results for that text description as well as related images. Have you activated Great Quotes Auto Tweets? Link Exchange for the Quotes Site.